Other Comments: Eight Days A Week” Beatles Tribute Band, recreates the Beatles Sound, truly capturing the excitement, high energy and feeling that The Fab Four created. 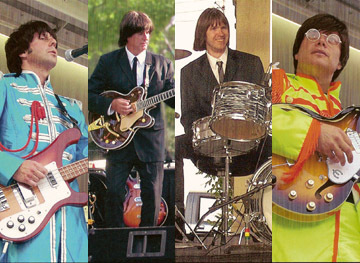 Performing in multiple Beatles costumes, wigs and Beatle boots, Eight Days A Week duplicates that famous sound by playing authentic vintage Gretsch, Rickenbacker, Gibson and Epiphone guitars, using Vox amplification, and Ludwig drums—exactly like The Beatles! Eight Days A Week features exceptional lead singers who create the distinctive smooth harmonies of the Beatles. Much research, care and attention to detail have been invested in this band’s performances, to mimic just the right look, feeling and sound. Eight Days A Week has performed for state Fairs, community celebrations, public concerts, country club events, weddings, and other special events. Indoors or outdoors, this group is a fun attention-getter for fundraisers and business functions.